“Q: iDVD video encode error when burning to DVD. The question above directed that someone online had been trapped by the iDVD video encode error and was looking for the solution. He would not be alone. There must be so many others who are pursuing the solution on how to fix iDVD error since iDVD is an excellent DVD burning program which brings a lot of fun and convenience for people. IDVD is a discontinued DVD-creation application for Mac produced by Apple Inc. iDVD allows the user to burn QuickTime movies, MP3 music, and digital photos to a DVD that can then played on a commercial DVD player. However, “video encoding error” often occurs when someone burns video to DVD disc from iDVD like the problem mentioned above. Then how can you get rid of iDVD error and fix it while you burn a DVD from iDVD? Part 1. How to fix IDVD error? Generally speaking, “video encoding error” often displays when you burn a video to DVD with the Mac built-in DVD converter—iDVD if you’ve never started iDVD before. To avoid this trouble, you’d better ensure that you have started iDVD before. To fix iDVD error, just follow these three steps below. Step 1: You can exit and restart iDVD at first. Step 2: You could make a new iDVD project then. Step 3: Lastly return to iMovie and add the Video to iDVD over again. If there is no other problem, you would have fixed the error and could burn a DVD from IDVD at this time. Nevertheless, if this doesn’t work well, there is another way to get rid of iDVD error—to burn video to DVD disc better on Mac with Leawo DVD Creator rather than iDVD. 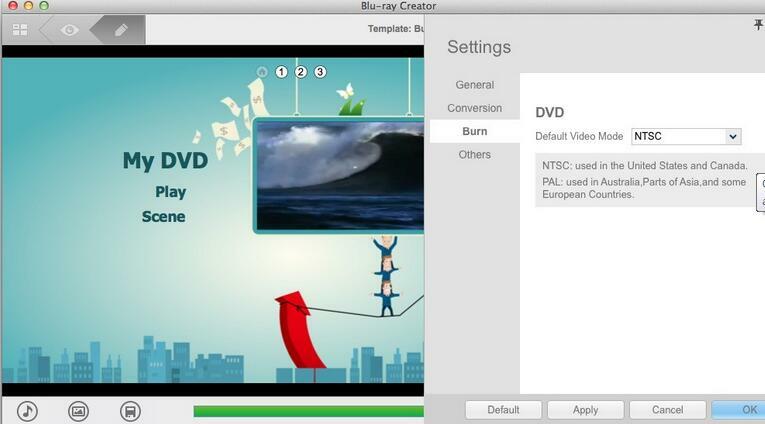 Leawo DVD Creator for Mac is one of the best Mac DVD burning software for Mac users to burn video to DVD disc on Mac easily. It enables you to burn video to DVD disc on Mac conveniently in either DVD-5 or DVD-9 format in accordance with your demand. Meanwhile, this program supports all video formats like MP4, MKV, AVI, and M4V to DVD etc. You don’t need to fix iDVD error at all since videos from any source could be burned to DVD on Mac with this video to DVD burner by the following guide. Tip:You can download and install Leawo DVD Ceator first now by click the download buttons below. Add single video file or a video folder to this Mac DVD Creator. Note: You can also drag the video file you need to add video files. After loading videos, at the bottom, select to burn video to DVD-5 or DVD-9 and choose a suitable aspect ratio 4:3 or 16:9. You can even choose the burning speed (fit to disc/2/3/5/7/9 Mbps). 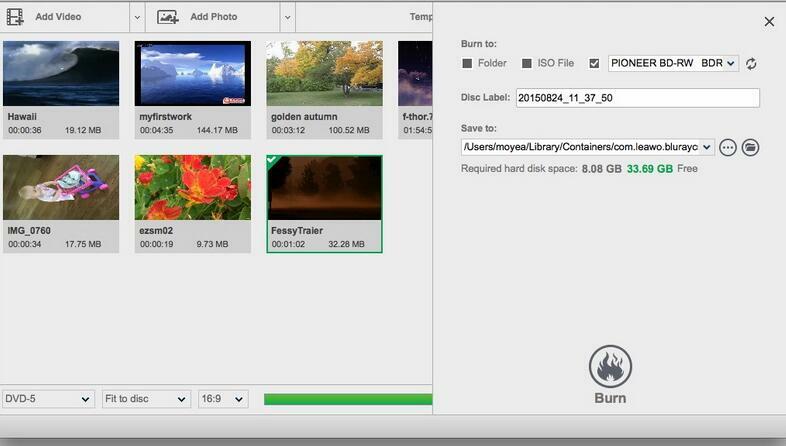 Space in need for DVD burning can be accessed here. There is an option “Preferences” to choose for program settings before burning, where you can select “General” which is for a program language from preset UI languages, “Conversion” to enable Priority native codec or not, “Burn” to choose default DVD video mode from NTSC and PAL conforming with the place you locate and “Others” which can add external subtitle, choose encoding and thumbnail (screenshot) location and format as well. Hit the big green “Burn” button to go to the burnin g setting sidebar, where you could set Burn to, Disc Label and Save to options. To burn video to DVD disc on Mac, you need to insert a blank writable DVD disc into the disc recorder drive, and then select it as target under the “Burn to” option. After you inserted a blank DVD disc to your DVD drive, choose path to save to, and typed the disc label, and then start to burn video to DVD disc on Mac by clicking on the “Burn” button. Next it will start to burn video to DVD disc immediately. Eventually, you got a DVD with which you can enjoy your videos at any time and never worry about the computer crash. It is steady and fast to burn video to DVD disc with the DVD Creator offered by Leawo Software and you won’t be afraid of the video encoding error that may occur when you burn a DVD from iDVD. As one of the most popular DVD creator on Mac, it would be strongly recommended for you Mac users whenever you want to enjoy yourself with videos in DVD.